the music that moves them: Stingray DJAZZ! Following the July 2015 acquisition of DJAZZ.tv, Stingray has rolled out refreshed and contemporary new looks for the channel, which have been rebranded as Stingray DJAZZ. Stingray DJAZZ will continue offering viewers the same expertly-curated programming they have come to expect from the team behind the leading television channels dedicated to jazz and related genres. Music fans will be greeted by an entirely new experience – including bold and exciting channel designs, new logos and colours. Stingray DJAZZ introduces a red and black colour palette reminiscent of the jazz esthetics of the ‘20s and ‘30s. The channel’s design, with its focus on artists’ portraits, is an homage to the musicians – both legendary and forgotten – of the smoked-filled jazz club scene of today and decades past. The font used in the logotype was created especially for Stingray DJAZZ; giving it a distinctive, edgy and original feel. The Stingray DJAZZ experience continues online with a brand new web platform. The website has been rethought to provide visitors with an immersive experience that includes increased visual and video content, as well as fast and easy access to schedules by program type. 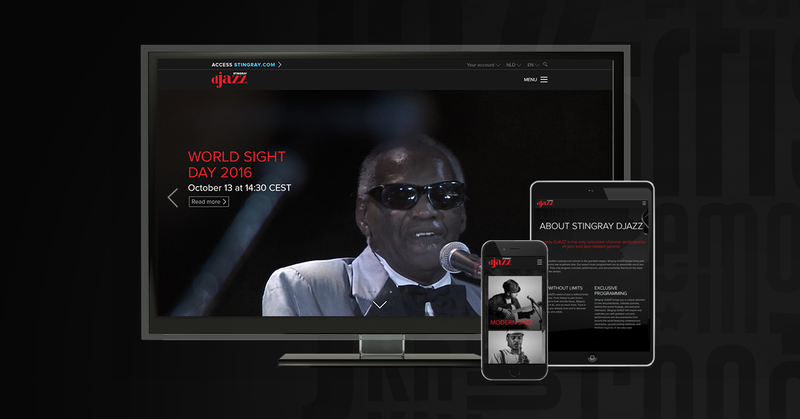 This redesign effort reflect Stingray’s commitment to offering viewers the best experience across all platforms and mark a crucial step in the global development plans for Stingray DJAZZ. Stingray aspires to make the channel available and indispensable to music connoisseurs worldwide. Stingray DJAZZ, living the world of jazz!